The girls arrived home from their first day of school with Scholastic packets from the teachers and new book recommendations from their classmates. M is dying to read Magyk by Angie Sage, the first book in a series that a friend raved about. I appreciated her enthusiasm, but part of me wishes she didn’t want to plunge into another series of huge, long books. Much of the last year’s been taken up with the Harry Potter books and books by Rick Riordan. 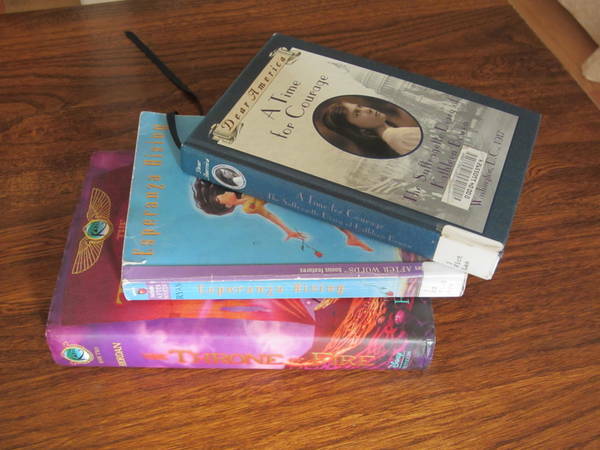 Don’t get me wrong: they’re all really great books, but I noticed that once M tried a shorter novel for a change (for her book group that I was telling you about–the next selection is Esperanza Rising by Pam Munoz Ryan), she began reading much more. My theory is that when she’s say, 220 pages into a book with another couple hundred more to go, she keeps reading at a steady pace. But when she’s 150 pages in and she knows that in a mere 70 pages she’ll learn everything that’s going to happen to these characters, she’s more motivated to not put the book down for a moment. She’s been tearing through Dear America books. Have I mentioned that I freakin’ love the Dear America books? I’m a huge historical fiction fan, so I’ve been stocking the home shelves with these books whenever I’ve seen them at cheap sales. In fact, it was because I had a collection of them that I loaned to my niece T that M bothered to take a look. Because of course Cute W’s and my recommendations are worse than meaningless. Examples: M resisted Harry Potter for years, and she has yet to read A Wrinkle in Time, the book that I loved so much in third grade that it made me decide on my first-born daughter’s name then and there. In any case, we’ve reached this awesome phase in M’s reading life when she wants to read books that I’d like to read, too. And I’m a sucker for gathering up books, so I trekked over to the library at 7:45 last night in search of Magyk. It was supposed to be there, but the librarian and I couldn’t find it. After some book chatter she pressed the book Wonder by R.J. Palacio on me. Apparently it’s the hot read-aloud among the 5th and 6th grade teachers. I started a bit of it with M last night, and we were both laughing within a few pages. She was back into it this morning, and when she tried to give me an update, I shushed her, because I think that I’m going to have to read it myself. I’m suffering from book envy right now because I’m doing my Snobby Book Group “required reading,” Half a Life by V.S. Naipul. I’m liking it alright, and of course it’s good for me to read–something described as a Nobel Laureate’s “finest novel to date” is an excellent addition to anyone’s reading list. But because it isn’t something that I’d naturally pick up, it feels a bit like eating eggplant to me. I’ll do it, it’s good for me, blah, blah, blah. I threw in a couple of recent good books for the picture just in case you need recommendations. I haven’t finished Anna Quindlen’s essays–they’re too close to real life, so I can’t read them at bedtime. I’m a pure fiction or completely foreign-to-me nonfiction girl at bedtime, and that’s when I get most of my reading done. I even have trouble sleeping after reading a magazine, because I start pondering recipes or organizing tips or workout suggestions and next thing you know I’m not sleeping. With my beloved Anna, even if her essay topic doesn’t make me contemplate my life, my sheer desire to be as cool as her becomes an insomnia-inducing meditation. And I’ve been on a bit of an Amanda Eyre Ward tear lately, because her novels are light without being stupid. That top book’s a short story collection, something I rarely like, and I really enjoyed these. She has some of the most awesome first lines ever. J, meanwhile, was also in raptures over the Scholastic order form, although she was distressed to learn that the super-cool Goddess Girls multi-pack with GG charm bracelet contained books that she’s already read. She’s deeply committed to that series as well as the Fairies books by “Daisy Meadows,” who is not a single author but a group of writers who are paying for their groceries by subjecting parents everywhere to the same insipid story of two girls outsmarting the stupid-clumsy-selfish goblins and helping the fairies. I’m sorry that I’m being so negative, but I have to let it out somewhere. I keep hoping that my clever almost-8-year-old will tire of the same plot after reading it with limited variations at least 30 or 40 times. And I’m not exaggerating. It’s especially bad because M will insult the books, and then of course I have to back J up, but good gravy, I can’t wait to get over these. I remind myself that they are two girl heroines, which is nice and feminist, and that being able to figure out and draw conclusions about the plot is a satisfying and developmentally-appropriate thing for young readers. Plus, they’re easy enough for her to read all by herself. But I wish she were done with them. The Goddess Girls are a slight improvement, I suppose. Almost all of the mythological references fly over J’s head, but the subtext offers the parents a little extra entertainment value. The other day J asked me to read her The Hunger Games and I said that she could read it herself (more on my policy here), but I would not read it to her. She stomped off in a huff. Maybe I should try to get M to sell her on some of the Dear Americas as read-alouds? Meanwhile, Cute W and the girls have just tossed off the shackles and finished the 15th book of the Guardians of Ga’hoole’s fifteen-book series by Kathryn Lasky. They really liked the books, but I think that they liked them about 12 or 13 books’ worth, so in the end there, they were just trying to prove a point. 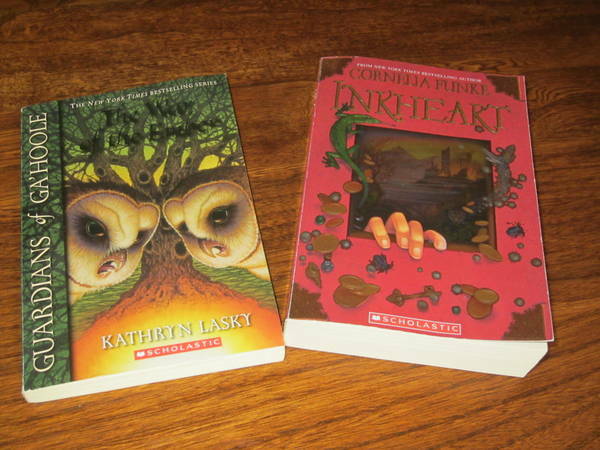 I think that they were all excited to move on to something new, and for now that’s Inkheart by Cornelia Funke. Ugh! It was only when I created a link that I realize that that starts a series, too! How about the rest of you? Reading anything good lately? I know I’m skewing old/girly, but that’s what I’ve got in this household. Just my opinion, but you should feel so blessed that your girls want to read! My 8 year old son despises reading. We’ve read to him every night since he was a baby until he was 6 and could start reading to us. I take him to the library so he has his pick of books, but its just like pulling teeth!! 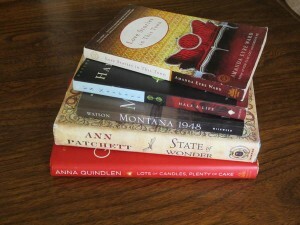 When you can make the time, can you give an age by age recommendation of good books. The authors and titles here are alien to me. Like when I was J’s age the most popular author people in my country read was Enid Blyton(British). And no one has even heard about her over here. I used to love reading the boarding school stories of Malory towers and St.Clares 🙂 My D is 4. So will appreciate good recommendations starting from age 4 ! My girl plowed through LM Montgomery’s Emily series, but won’t touch the Anne books, much to my chagrin. We listened to most of The Lightening Thief on the long drive home from vacation and I’m hooked on Rick Riordan, but might save those for audio books, so our 5 year old can access them too. And we’re plowing through Magic Tree House as read aloud books for the 5 year old (started at 4). Also recommend Roald Dahl as read aloud for the 4-6 year old set. Thanks for the Dear America recommendation! All great titles!! Wonder is one of our favorites of this year. A short, light read aloud for families is The One and Only Ivan by Katherine Applegate. There was a little bit of trauma due to an animal death but if you can get past that, it was cute. There is a wonderful resource that the Birchwood librarian maintains that contain titles for each grade level that have been reviewed by teachers. I’m linking the read aloud page specifically. 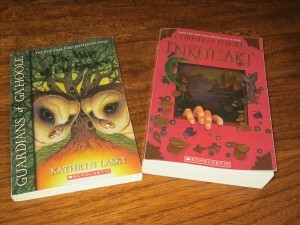 http://www.nisk.k12.ny.us/kidlit/readalouds.html Enjoy!! Try another of Suzanne Collins’ (Hunger Games) books: “Gregor the Overlander.” Evidently, it is the first of a series, but my kids only read the first so far. My son likes anything Riordan, and my daughter is starting Anne of Green Gables. (Lots of series!) If you like Esperanza Rising, try one of Ryan’s other books, Riding Freedom, based on a real woman’s adventure. Another interesting read is Ruth White’s “You’ll Like it Here (Everybody Does).” An “old” hit was The Westing Game. My daughter is 8 and on the 3rd book of Magyk series (Septimus Heap). She is also on Harry Potter 6th book and so far the Magyk series seems way easier than Harry Potter big books. 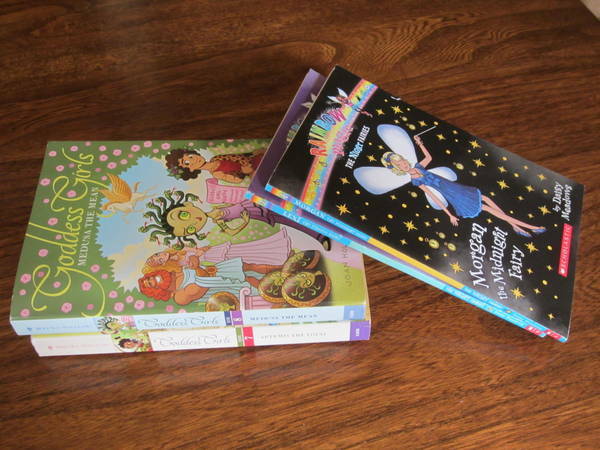 Angie Sage have another series other than Magyk that is intended for younger kids and the books are really cool. Is Araminta Spooker. @Melissa, absolutely, I am so lucky that they’re both big readers (and I’m knocking on wood). That’s another part of the pep talk I give myself when I start reading another fairy book. I think it would drive me crazy if they hated reading. On the other hand, Cute W wasn’t a big reader and he turned out okay! @Erin T, oh, Cute W did a ton of the Magic Tree House books with the girls, and he’s done a couple of Roald Dahls, too. My kids watched an Anne of Green Gables once, but have yet to pick up any of the LM Montgomery books I’ve “casually” put on the shelves–but loving Emily and skipping Anne would drive me crazy! @Cheri, yay, thanks for the link! If I can’t find my old email I might have to hunt you down for blog recommendations for Jahnavi. @Emily, oh man! These all sound good! There’s not enough time for all of the boos we want to read. @merce, oh, maybe the younger Sage will be good for J–she wants to keep up with M, but it’s still tough for her. Thanks, everyone, for the suggestions! How about those old chestnuts, All of a Kind of Family and the Little House books? No fairies in sight. @Big Sister, I do love All-of-a-Kind family—we’ve read them all. The Little House books were not a hit at our house–so sad! I remember we tried to read them out loud and it started with a long description of butchering animals and the girls were like, no thank you. I swore that the books were really good, but they didn’t believe me. @amy, M loves Carl Hiaasen. She’s done one or two Judy Blumes, but they were for younger readers–she hasn’t hit any of the big-time adolescent girl angst that Judy and Paula provide, and part of me fears that it’s an infection that I can spread by putting it into her head. . . .perhaps that’s crazypants. I had the exact same fear about Judy Blume and decided against suggesting it for my 9 year old because of it. Reassuring to see I am not alone. I forgot that she also did take to Louisa May Alcott. Started with Eight Cousins and is now almost finished with Little Women (although my memory of the really sad chapter was much earlier in the book than it really is, and I felt compelled to warn her that something sad would be coming, but did it way too early). @Erin T, LM Alcott’s another one sitting on our bookshelf hoping for some attention. M was recently reading Bridge to Terabithia, and her carpool showed up just as something dramatic happened and she could barely tear herself off the couch and compose herself for the ride to camp.